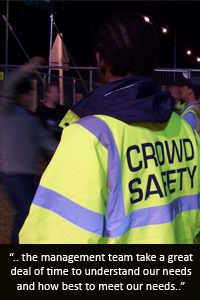 Secure-Ops Ltd have secured the needs of many events across the country. From high profile public events to corporate functions we have designed an event security solution to the events specific requirements. All of our staff are experienced in dealing with a range of event security needs and the Management Team always ensure that the right people are placed on the right events. We recognise that as event security we are the face of the event and as such have invested in the image of our staff, both with new uniforms and staff training on appearance and the impact it can have on peoples perceptions.